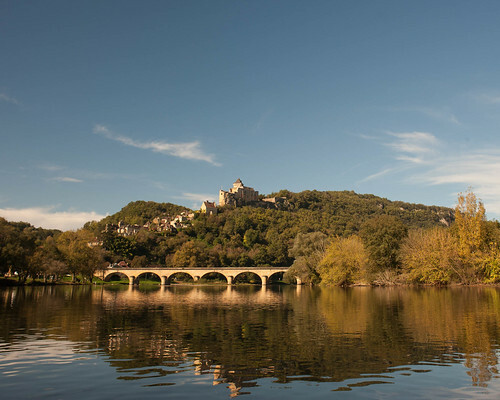 A night scene from a paddle underneath a full moon passing the Castle at Castelnaud on the Dordogne river in France. 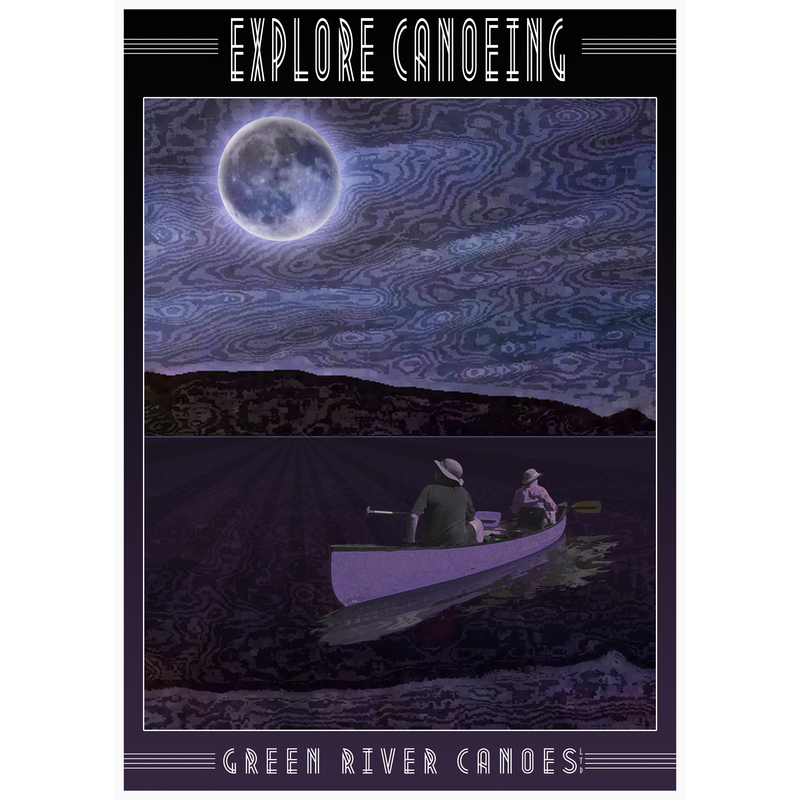 Have you ever tried canoeing at night? It can be tricky but if you choose a clear night with a full moon and you paddle a stretch of river you have paddled many times before then you are in for a treat. The water glistens, the stars shine and perhaps a few distant buildings are still lit up. 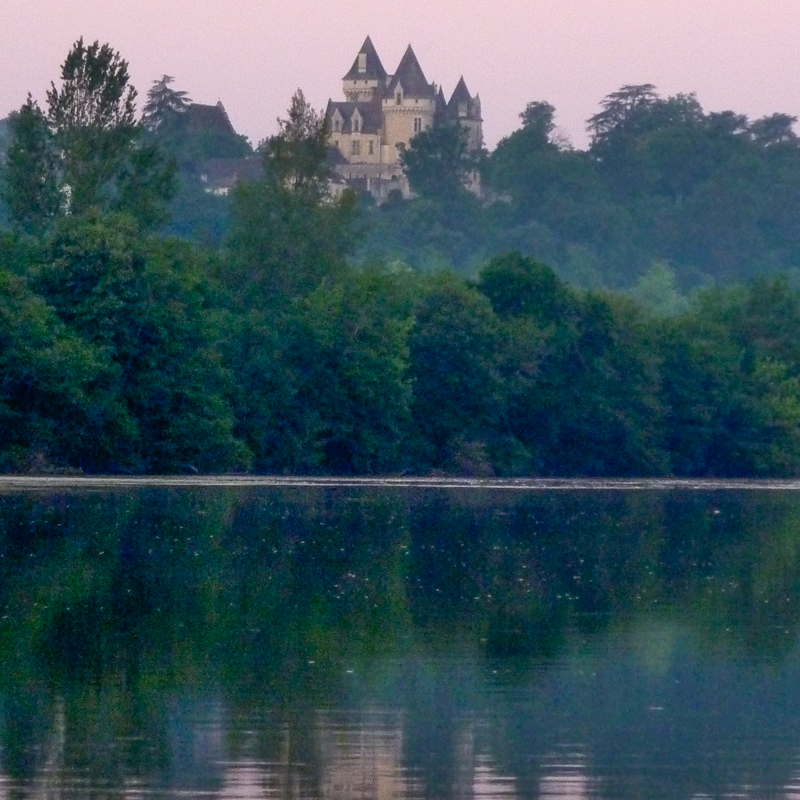 We’ve canoed a stretch of the Dordogne in France where the castles are lit up until midnight. It’s an amazing sight. And then the lights go off and the river regains its own dark beauty. You have to attune your senses to the sounds of the river as only the faintest glisten gives the movement of the water away. Strange plops and splashes herald some activity by the wild-life perhaps, but you cannot be sure. Just be careful though and keep a torch handy and I would avoid the rapids! My photography blog tells the story of a particular night when I went out to take a night time shot of the lights over Beynac castle. 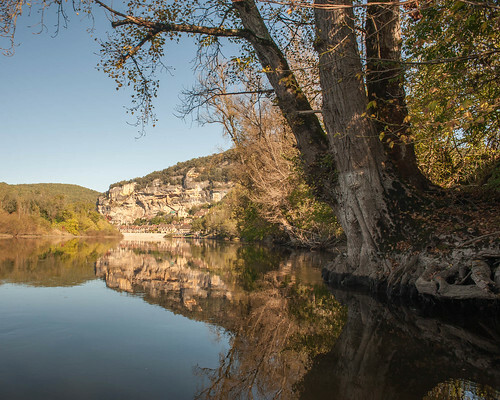 This entry was posted in 28 Reasons to go Canoeing and tagged Beynac, Canoe, Castelnaud, Dordogne, full-moon, moon, night, River, stars on February 12, 2014 by Green River Canoes Ltd. Some people who come on these trips join me in the morning for a walk before breakfast. I have walks for every morning for those that are keen and depending on the time of year and the inclinations of the guests we choose a time to meet and a length of walk to suit everyone. Some of those that have joined me for walks everyday of the trip have told me at the end that they feel that they have had two holidays. A walking holiday separate from the canoeing holiday that happens before breakfast. On this morning I try to persuade people to come on an extra special walk which takes about three hours. We have to make an incredibly early start and aim to be out and about by 5.30am or 6am at the latest. The aim is to get back to the hotel at about 9am just in time for a second breakfast. More of that later. Depending on the time of year the real trick is to get going at sunrise, or slightly after, when the sun is just rising over the castle. You can imagine how early this can be at the height of summer. 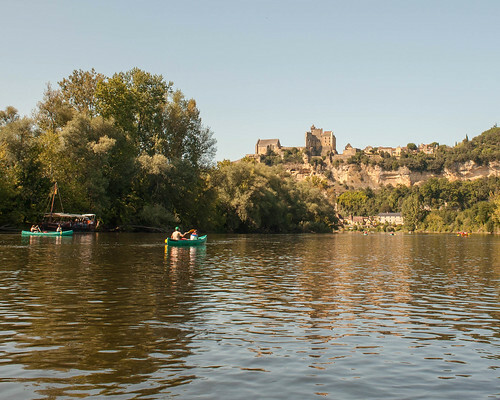 I have a surprise for those that do want to come with me as I explain that we will first do a short canoe, of about 30 or 40 minutes and then abandon our canoes on the far bank and walk in a huge loop from the Château Milandes to the Château at Castelnaud, across the arched bridge and back along the bank-side river trail to Beynac. 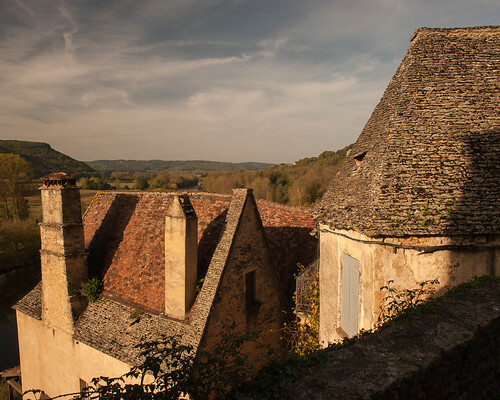 If they are aghast at this then I will encourage them by mentioning that we should arrive in Castelnaud just in time for the bakery to open, where we can buy a pastry, and that the cafe will just be opening and we can fortify ourselves with a strong coffee. The logistics of doing this can be confusing. 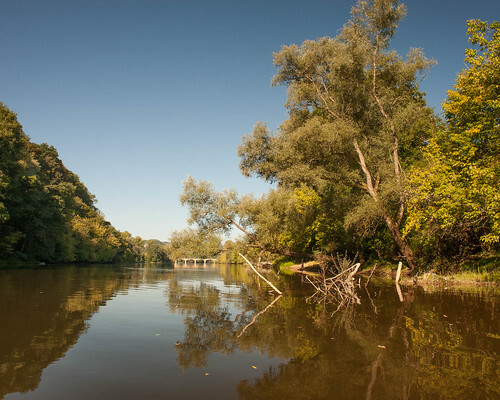 We will have to take paddles and life-jackets for the canoeing stretch and our hiking boots for the walking stretch. If everyone comes then we will catch up with our canoes later by driving. If only a a few come then we will have some fun later trying to squeeze everyone into the remaining canoes and worry abut the fact some will have no paddles to help or indeed a life-jacket to wear. We will worry about this later. So, quietly letting ourselves out of the hotel at an ungodly hour we will fetch the paddles and life-jackets from the van and go down to the water. I mustn’t forget to return the key to the driver! It may be still dark at this point and we will have to carry the boats from the bank and slip them into the water and get aboard with our stuff and probably feeling a bit uneasy wearing our clonking hiking boots in the boat. 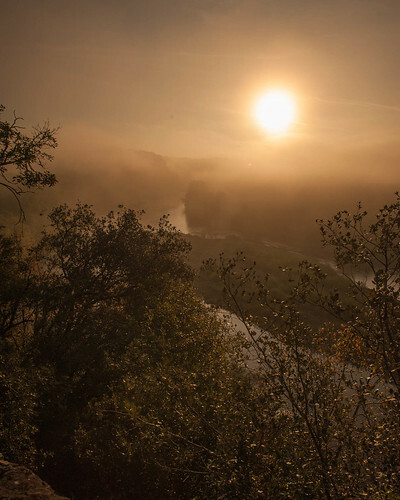 Usually a rolling mist is floating above the strangely calm and quiet river as we set off and we will be talking in hushed voices. Ahead of us I will point out that we have a large group of islands with the main channel on the left, a very shallow centre channel and a quiet channel on the right which is almost hidden from view by an overhanging tree. This is the way we will go, for it is along this channel that we have the chance of seeing some sleepy wildlife. Being careful as we enter the channel we have to negotiate the bend in the river, the quickening of the current and the tree whose fingers seem to want to grab us. Once on the other side we can see that we have a steep cliff on our right and some muddy banks and grassy verges on our left. 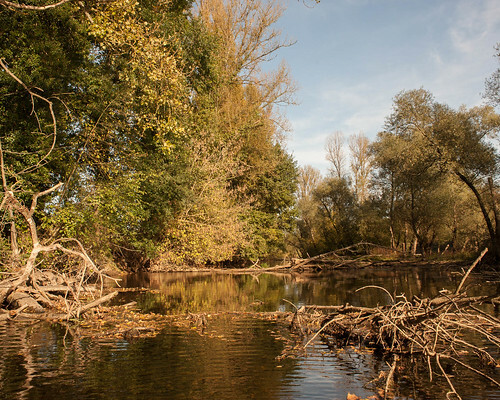 Depending on the river levels we can see many smaller channels leading into the interior of the islands though the ways are often blocked with small fallen trees and bushes. I encourage everyone to whisper as we try to glide noiselessly through. Sometimes we will disturb Nutrias sleeping on the bank and we’ll be able to watch them slip into the water as they swim away. They very rarely dive, as an Otter would, and so you can watch them make themselves scarce. As usual we will disturb a number of Mallard ducks and as we come out at the far end of the islands where numerous channels come together we usually see a pair of swans whose whiteness eerily becomes more obvious as they appear our of the mist and gloom. We will give them a wide berth, particularly if they have Cygnets and we will creep past the wooded parts of the island before joining the main stream. 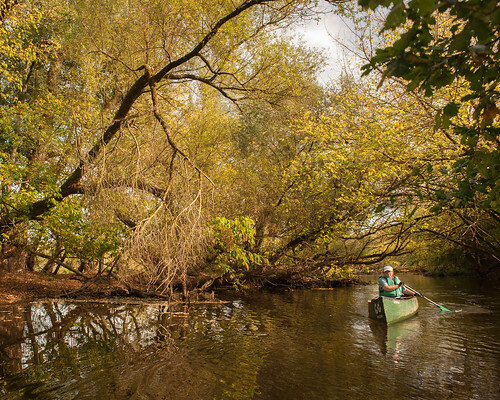 It was at this point several years ago when I was paddling with my friend Marc from Canada that we disturbed two huge birds that rose blackly from the tree as we passed. They were obviously Owls and we surmised later that they had been Eagle Owls: Europe’s largest species. They hardly made a noise as their shadow passed over us. Over on the far river left you can see the river is flowing quite swiftly but to get over there we have to paddle across a shallow and weedy section, being careful not to catch our paddles as we go. 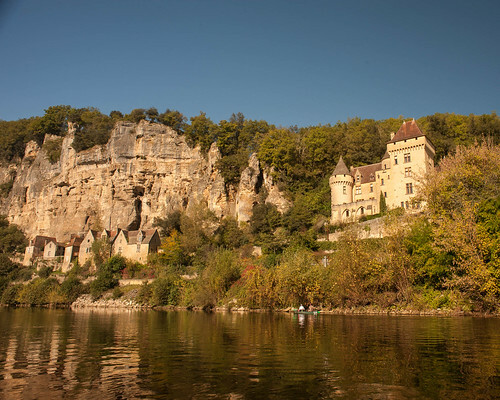 As we finally reach into the fast water I tell everyone to look back because we now have a superb view of Beynac castle standing blackly above the village, the river and the mist. If we are lucky with the weather and have timed it correctly the sun will be just breaking over the parapets and battlements. 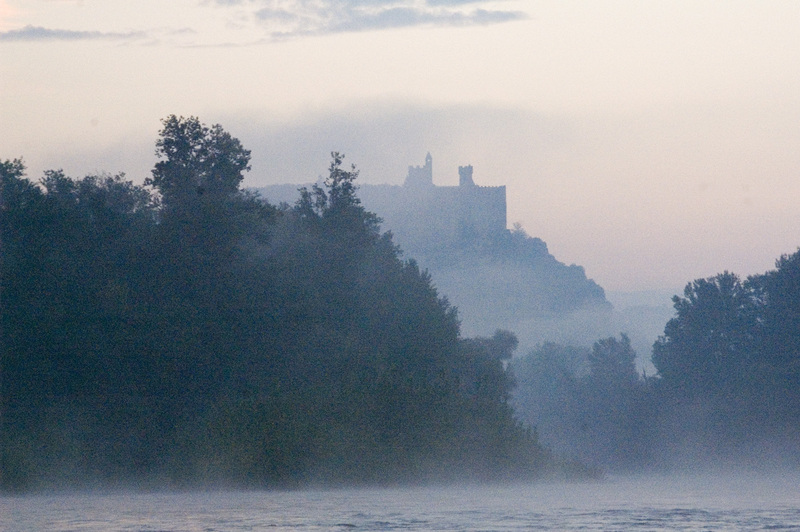 The river is so fast here that we can just spin our boats around and drift through the rolling mist still circling above the waves and watch the castle gradually distance itself from us. A view that has been possible for a 1000 years. Getting ourselves together we turn our boats forward again just as we are approaching the railway bridge. I encourage everyone to change sides of the river again and drift over to river right as we pass under the arches. 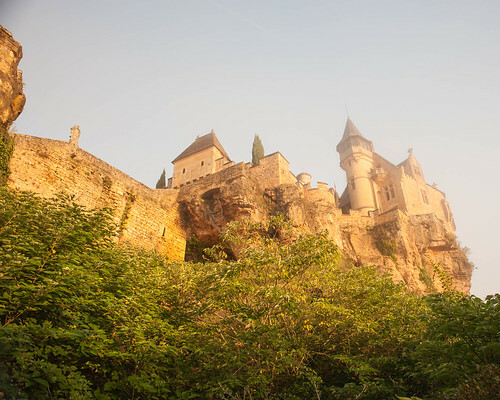 We are rewarded with a view of the Château des Milandes in the distance as it too, usually, sits above the mist and forest. 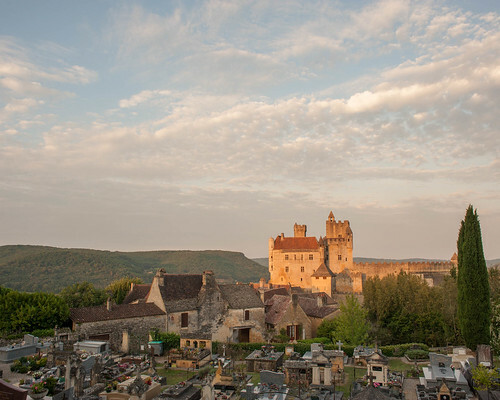 The château doesn’t have the menace of Beynac, nor its blackness. 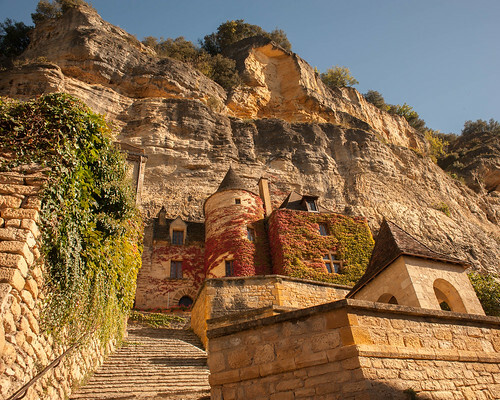 This Château was built to house the lords and ladies of Castelnaud in times of peace. In this way they wouldn’t have to suffer the sounds and smells of the armed forces that occupied the fortress and would only retreat behind its safe walls in times of strife. 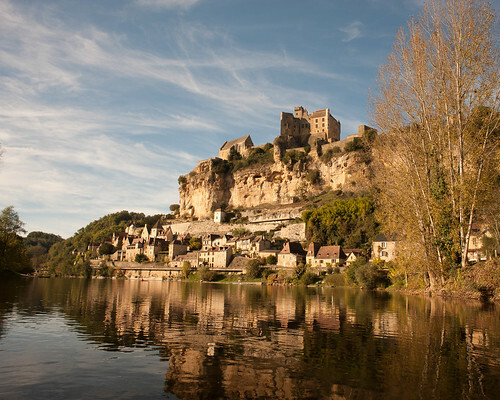 We will visit both of these castles today, but first we must find our take-out point on the left riverbank so that we can start our walk. We are looking for a concrete ramp which is next to a small pumping station. 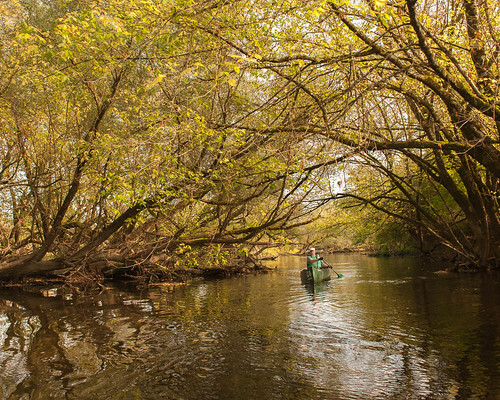 To help us a canoe outfitter, on the right bank, has impaled half a yellow canoe on a pole. Once we’ve seen that we can search for our ramp. When we pull over we jump out, trying not to get our boots wet, and we drag the canoes up the ramp a little and tuck them into the side and hide our paddles and life-jackets underneath. Everything else will go with us, so hopefully we haven’t go too much to carry. By this time almost an hour has gone by and we must now start our two hour hike. 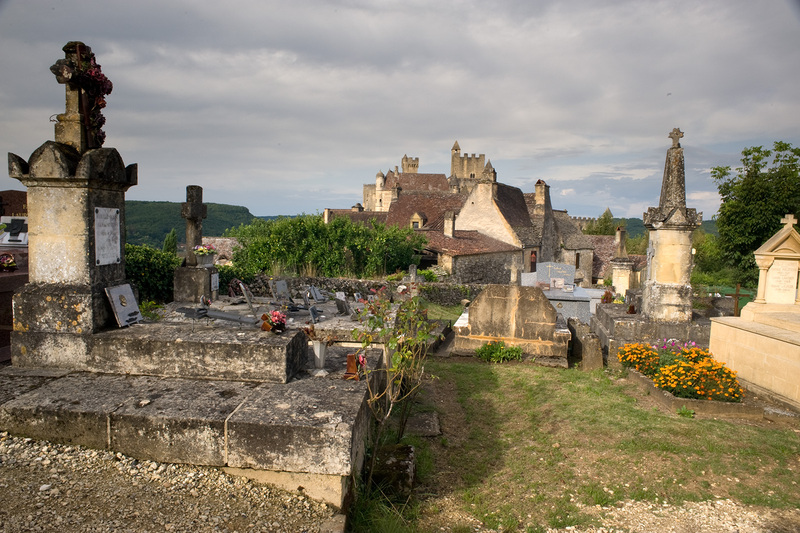 Remembering that we will be back here later in the day we can hurry up the lane to the road and stride past the memorial to Josephine Baker (we’ll have lunch here later) and take a right on the small road that starts to climb the hill as we head towards Castelnaud. 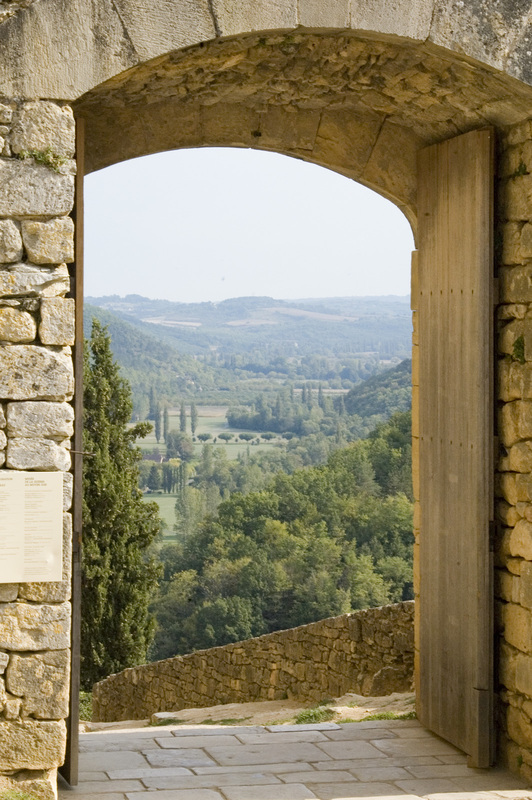 As the roads twists and turns and rises we will get another glimpse or two of Château des Milandes. The road then turns away, still climbing, and passes a dark wood in which a house can be glimpsed. Stranger still an outdoor swimming-pool, with a fairly recent plastic dome now covering it is also here. I’ve never seen it in use, though to be fair I only ever pass here early in the morning. The road takes an S shape here and drops a little revealing a couple of meadows. From time to time we disturb some deer here. To our left a small dead-end road leads to a farmhouse but we turn right as the road continues to climb. Finally we reach the crest of the climb and notice a trail disappearing into the woods on the left. This is not the way. I’ve mistakenly gone this way and been on a massive detour which comes out somewhere near the Château Fayrac. I did this once with a guest who thought I was lost and he got so frustrated that when we eventually stumbled out on a road he waved down a car to ask the way. I was right! Though I was still annoyed that I’d taken the wrong trail. A few yards further down is another trail leading left into the woods. 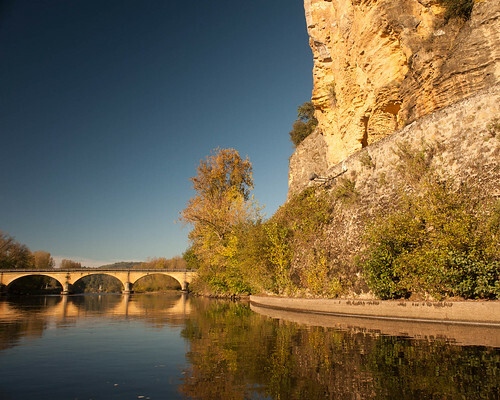 It is also signposted for Castelnaud, as is also the road, if we don’t take the trail. The path is indicated as being shorter, which it is, as the road has to wind a long way around to get to the village. However this is also the wrong way, and although it’s not as big a diversion as the first ‘wrong way’. I’ve been this way too. More than once and the trail includes a long dark descent through the woods and then a long slow climb out again. So, safe in the knowledge accrued by getting lost many times, we stay on the road until a third trail appears on the left, just past a small house. This trail leads downhill with the forest on the left and open fields on the right. It’s a pleasant open descent with good views as you pass a sleepy farmhouse, with an old dog with barely the energy to raise a bark. Just past the farm the road winds down past a wood that has been recently felled and replanted. A huge tower of cut wood sits on the side of the road. It’s been there a few years now. On reaching a cross-roads we strike straight across and up a steep road with high hedges either side until we reach a crest at another junction and we can see the road sweeping down to the village in the distance. It looks simpler to go this way, but this would mean following the road down. Instead we turn sharp left up a very steep road until we come to a group of houses which are at the very top of the Castelnaud village. 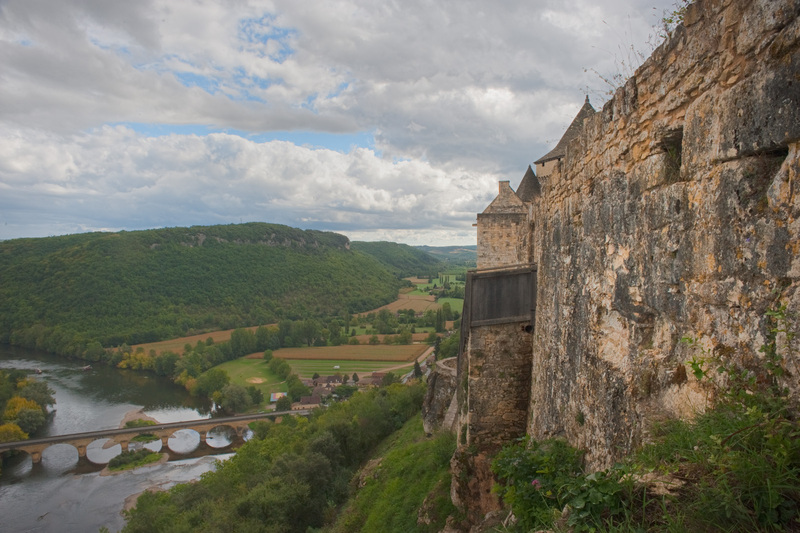 As we come around the corner we are surprised to find that we are looking down towards the top of the Castelnaud castle. Usually it’s still misty at this time and the castle is often floating on a sea of mist. We walk past the few houses, losing sight of the castle, and reach a path that leads to the last house. We have to follow this path and it looks all the world like we will have to knock on the door but just as we approach the gate a small path runs off to the left and ducks into the wood. 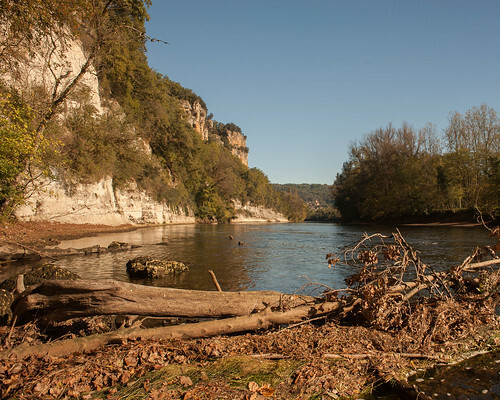 This is a fabulous little trail because it follows the edge of the cliff which is high above the Dordogne River and before long we are getting glimpses of the river far below. Or sometimes we do as sometimes you can see nothing but fog and mist and you wouldn’t know what lies below. I should mention that one time I met the lady who lives in the house we’ve just past and she walks every morning along this path all the way down to the castle and then all the way down to the lower village to the bakery and then returns again. That’s a fair hike. 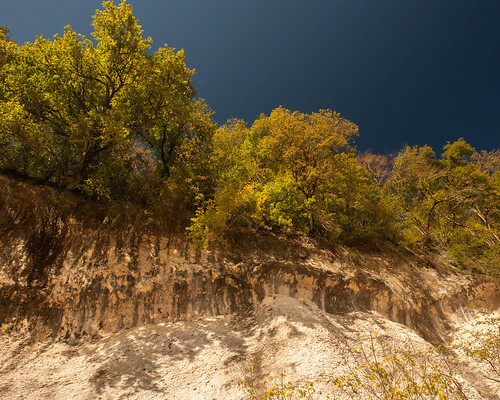 As we creep along this wood on the cliffs edge we suddenly breakout at a huge statue of a cross which overlooks the river. The views from here are fabulous. 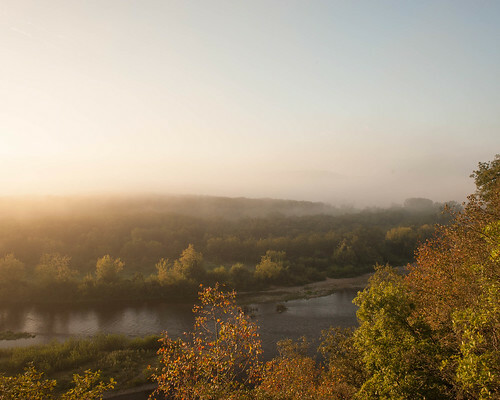 The river sweeps below us, and on its bank is the flat farmland we will walk by later. 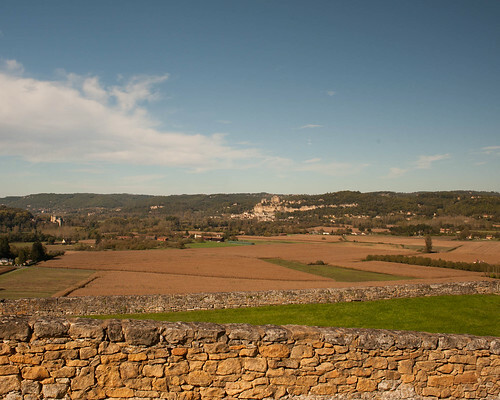 Further away is the Château Marqueyssac with its famous box hedge topiary and in the far distance the cliffs of Roque-Gageac can be seen. After admiring the view we continue along the muddy trail until it turns right and start to go down towards the back of the castle which is coming into view. The path is now cobbled and is the remains of an old Roman Road built up to a fort which previously stood on the castle site. 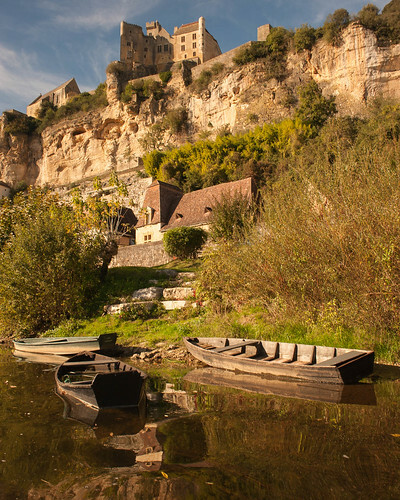 If we have time we can take a detour here and clamber back out to the cliffs and attempt to scramble out to the front of the castle below its exterior walls. This is not easy and you must scramble into the ditch surrounding the castle and push yourself through some scrubby trees which are blocking the way. It’s a precarious vantage point once you are out there, but the views are wonderful and seeing the castle from this vantage point is unique. So after a brief flurry of photographs we return to the Roman Road and continue the descent into the top of the village as we come to the level of the castle and finally stumble into the area of the village where we were yesterday when we visited. It’s great to be here this early in the morning. It is empty and quiet. 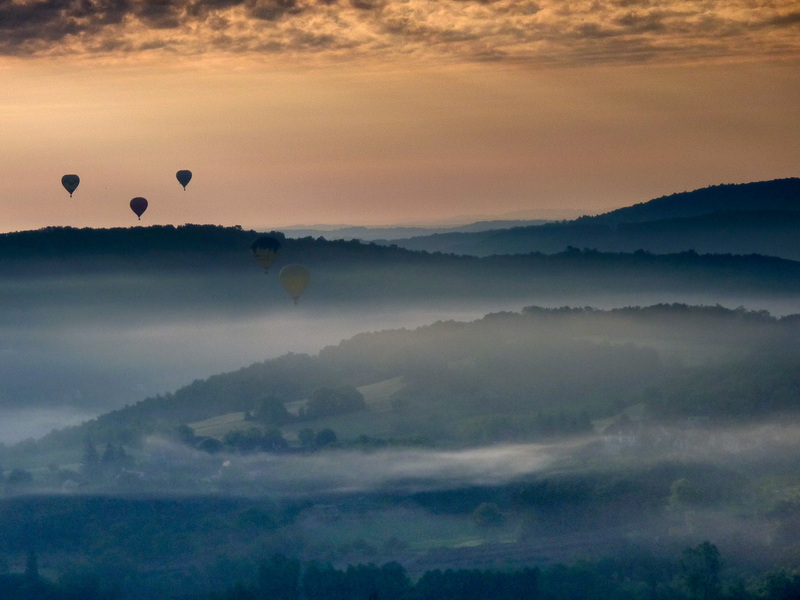 The light is warm and golden (sometimes) and from time to time we are surprised by huge hot-air balloons rising in front of us as they take off from the fields below the village. We quickly drop down through the village following the path we took yesterday. Down past the church and the cemetery. 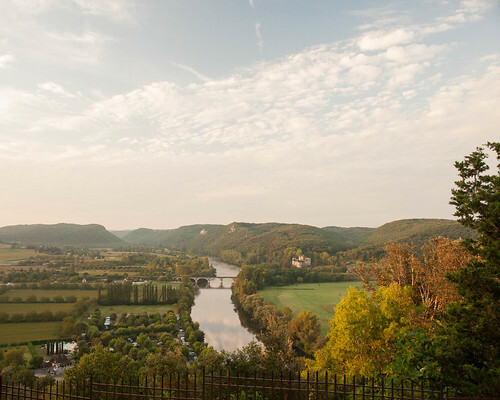 Perhaps time for a quick glimpse over the river and the Ceau Valley before finishing the descent down to the river where we find the bakery. It’s open if we have timed ourselves correctly and it is now 8 o’clock. It is to be hoped that the proprietor of the cafe is awake on time and has the cafe open. We can get a coffee. 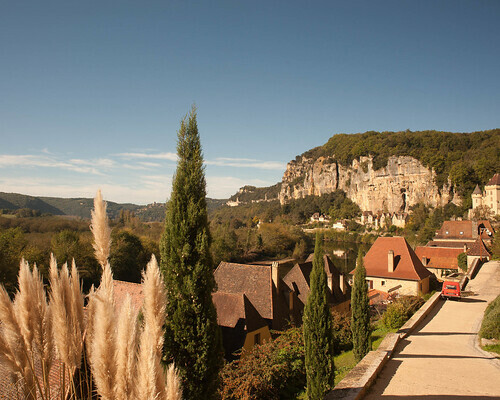 After a brief break we ready ourselves for the last leg of our hike back to Beynac. At least it is flat as we will follow the riverbank all the way. So first we cross the bridge and then drop off the road onto the path. At one time this section was unkempt and we had to drag ourselves through a hedge. Now a new path has been made and we no longer have to take a diversion around a farmhouse which sits on the bank. This part of the walk is pleasant and brisk. The warmth of the day is beginning to rise and everyone, cheered by the coffee and cake, is keen to get back to a proper breakfast at the hotel. After a while our path passes a couple of camp-sites where we can see some early morning risers and perhaps a dog-walker or too. It was along here many years ago that we were surprised by a dog running towards us apparently being chased by another, stranger creature. The dog was friendly and inquisitive but its friend turned out to be a young kid goat, who kept a safe distance, and then rejoined his dog friend when the dog decided to leave us. I’ve always wondered how that goat got imprinted on the dog and where the strange couple lived. Continuing along the sandy trail we eventually get to the Fayrac railway bridge, through the arch of which we get a perfectly framed image of Beynac Castle. Not far now as we pass some sports fields where once upon a time was camped a World War 2 festival of some kind. A whole sea of Khaki tents and men in GI and French and British uniforms and Jeeps and half-tracks zooming about and saluting each other. Quite a sight it was and it made me smile. No Germans I might add. The trail then gets squeezed between the river and a hedge marking the boundary of the last camp-site before it pops out onto the road at the Hotel Bonnet. When we first started coming here we used to stay in this hotel. It was pleasant, if a little quirky, and a little noisy as it is right on the road. Unfortunately it closed several years ago – we heard due to fire-regulations – and has never reopened. How Marc used to love the girl in the silk dress that used to manage it. Just here the river turns sharply left and a concrete ramp leads down to the river, where we used to leave our canoes, but where now a whole row of fishing punts lines up. These boats amuse me because they always seem half full of water as they are now and for all the world look quite unfit for purpose. But when I do occasionally see a fishermen prepare one he simple bales it out, unchains it and rows it out to his favourite spot. We are almost home now as we walk the narrow path overlooking the river with the busy road beside us. If you look closely into the water far below, and if the light is at the right angle, you can see the huge size of the fish down there. Huge black Barbels which are a kind of catfish. And then, before you know it, we are at the Hotel Château and can get to breakfast after a quick wash and brush up. I’m starving. After a breakfast which offers more than the usual ‘continental’, with boiled eggs and ham and cheese, everyone can prepare for the days proper work. 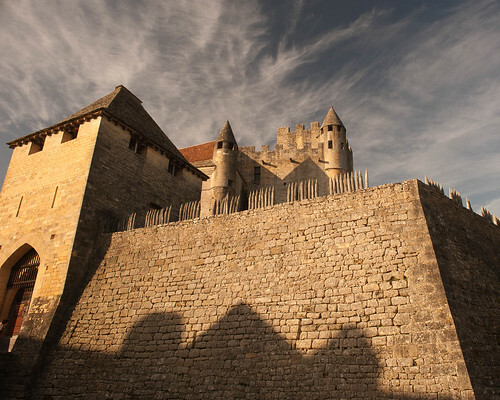 First we are going to visit the Château Beynac which is looming large above our village. 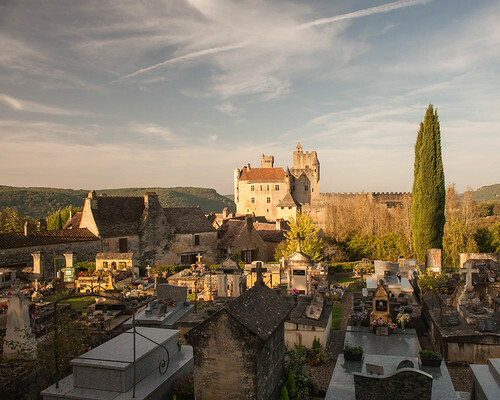 We will walk up through the village on the cobbled lanes and get into the castle when it opens its doors at 10 o’clock. We can wander around the castle for an hour or so where we will probably have the place to ourselves. We will then wander back down through the village and rendezvous at the canoes at midday where we left them yesterday. The van is driving up to the castle for those that would like a lift and I shall walk up the hill to the castle gates. Usually I don’t go inside the castle; not every trip anyway, but usually use the time to take some photographs. 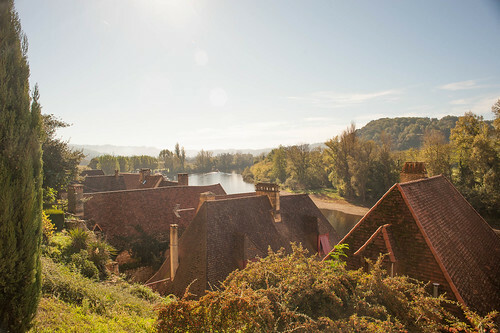 The walk up through the village is beautifully scenic and the views over the river and the valley is fantastic. I remind those that are going into the castle to explore every thoroughfare and make sure they get to the very top. This castle has a very different feeling from Castelnaud. It has a more informal feel and is usually less cluttered with visitors. 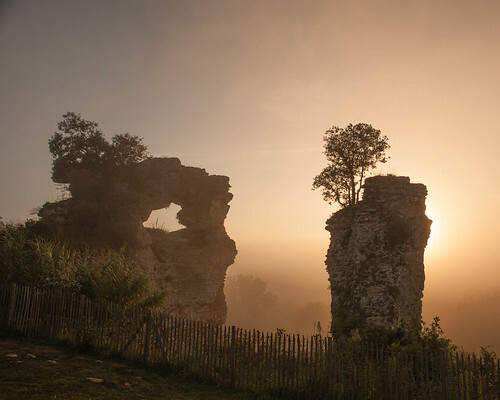 It’s hard to believe that Richard the Lion-heart was briefly the King here in the 12th Century. When everyone is done with the castle we meander back down to the hotel to get ourselves organised for canoeing in the afternoon. We muster everyone at the boats and get all the gear necessary. Of course it is highly like that we don’t have enough boats for everyone if some of the boats were used on the expeditionary hike this morning. We will either have some fun with three in a boat or some will hop in the van for a drive around to where the canoes are. Once ready we will set off and probably take the same route on the right of the islands as we did this morning. We still might see some wildlife as not many canoes go around this side. 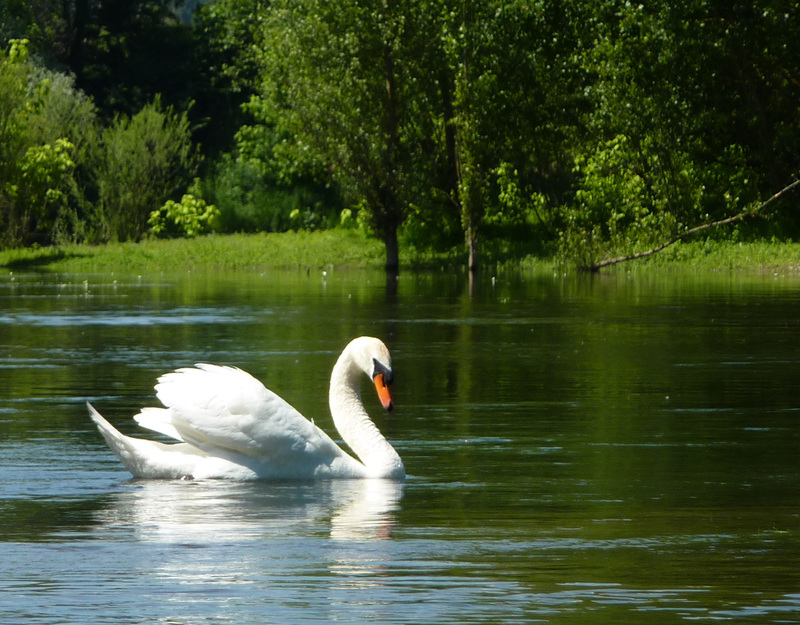 We’ll probably see the swans again as we pass the island and then spin our canoes around to get a good view of the castle. Before long we are pulling up at the same ramp as we were at this morning. Déjà vu? Here are the rest of our canoes and our gear is still safely stowed beneath them. We’ll tuck the rest of the boats away and stash our gear again before changing into our walking shoes. 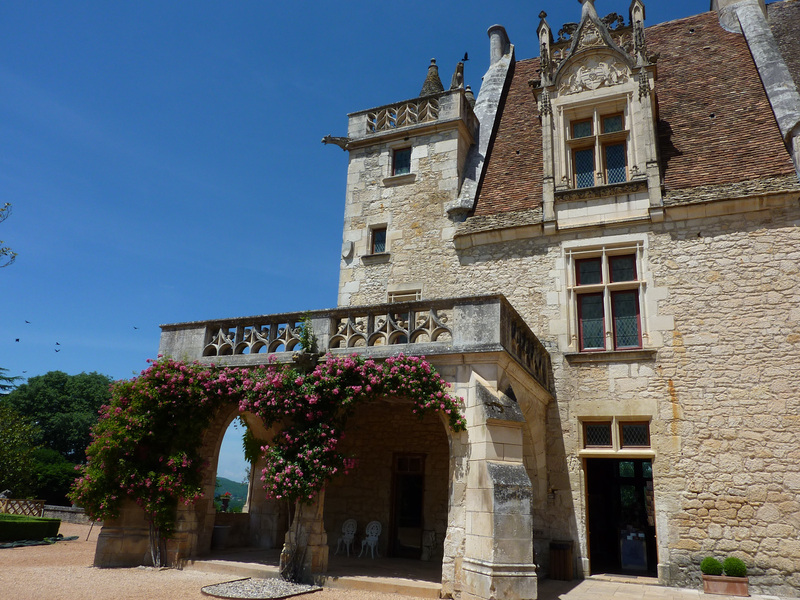 It is to be hoped that the van is here to meet us and we can decide who wants to ride up to the Château Milandes and who wants to walk: it’s only 15 minutes. At the castle gates I will make sure everyone gets a printed guide and I explain that you guide yourself through the castle, in a one-way system and that the whole castle is dedicated to Josephine Baker. She was an exotic dancer and singer from the USA who came to France, because her material was too racy, and danced in the clubs in Paris. 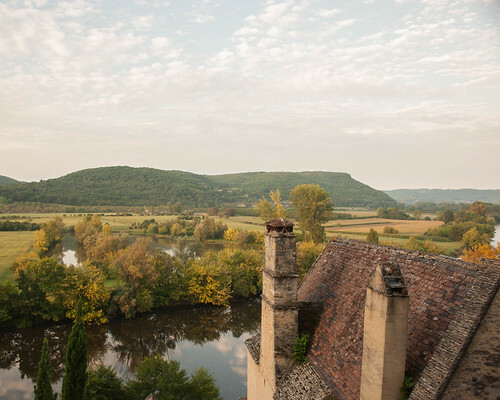 She eventually married and lived in this castle …. when you can find out the whole story by coming on the trip with us ….or looking elsewhere on the web. It’s a fascinating story and the castle and ground are well worth a look around. As an aside they also have falconry displays in the castle ground and it is possible to visit the birds too. Whilst our guests are busy here we return down through the village to the smaller Josephine Baker memorial garden in the lower village. We can use a picnic table here to set up lunch in the shade of a tree and our guests can meander down the hill when they are ready. Eventually our guests come back and we have a lazy lunch of bread and cheese and fruits and meats, perhaps with a glass of wine or two. We have had a long day already and we still have an afternoons paddling to do! Eventually we will get ourselves together and walk back to the river and start our paddle. How far to go though? 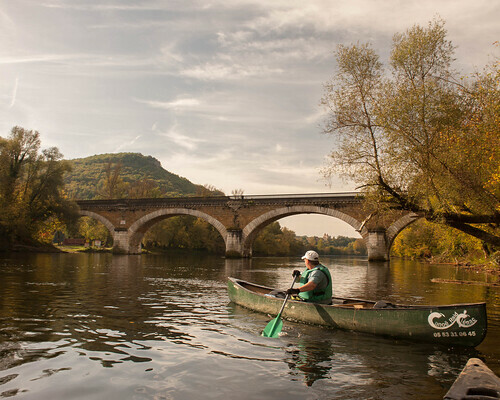 At the least we will have about three hours paddle to the triple bridge at Le Garrit and if we want to go further it is another hour and a half after that to take the canoes all the way home to Siorac and the base of Canoe Raid and our friend Eric. 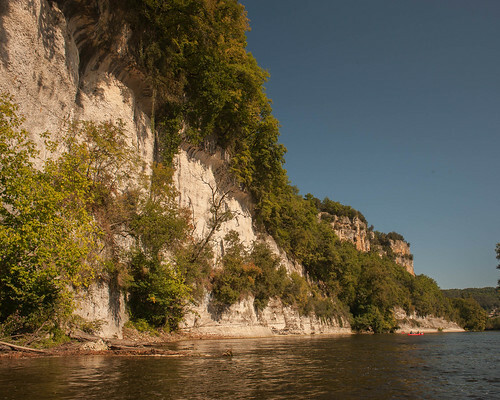 We can have some fun on this stretch of paddling because we have several islands to negotiate and we will have the river mostly to ourselves. 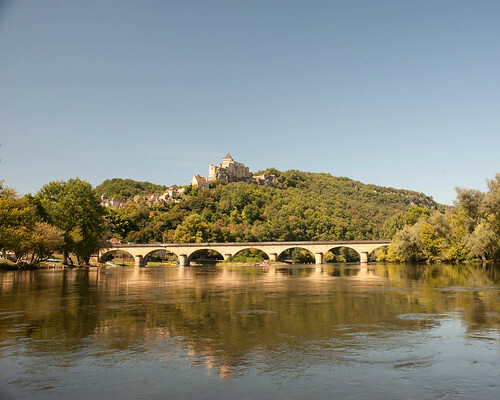 The crowds of yesterday are well behind us as we continue down the Dordogne whose valley is slowly opening wider and wider. 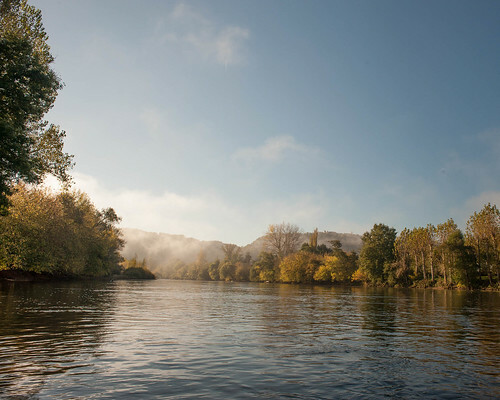 After a short while we will pass the small village of Envaux on river left and almost immediately we will have an island. It looks shallow and impassable on the left side, which it sometimes is when the river is very low, but usually this is the way to go. It’s quiet, it’s overgrown and it’s great fun to wander down this shiny bright stream even if you have to get out and wade for some stretches. Inside here is a different world. Hundreds if not thousands of damselflies all around. Fish skittering underneath the boat in clear water. The ducks will clatter and moan and the Kingfishers will flash. 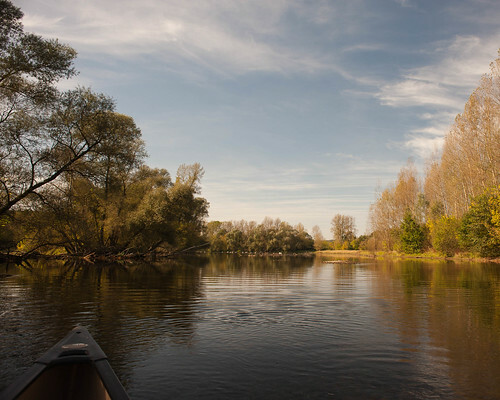 The canoes will graze over the shallowest parts and you’ll be surprised by sudden deep pools. If you are pulling your partner who is staying in the boat it can be fun swimming through the deeper green and limpid pools. It’s all a bit African Queen in here, although without the gin bottles floating by. From time to time we may have to negotiate a fallen branch until eventually we come to where the channel turns sharply right and heads towards the main river. It is shallow here and the boat will need a sharp tug before finally we nudge the canoes back out into the main stream which seems to be rushing by at quite a pace. We will now hug the left bank as we continue. For two reasons; first because we are looking for further channels to explore and second because this is the only place to find some shade from the midday sun. Some of the channels on this bank have become overgrown with new willows and the entrances are blocked and from time to time I go into a channel only to find I have to back myself out as the way is blocked by a fallen tree. 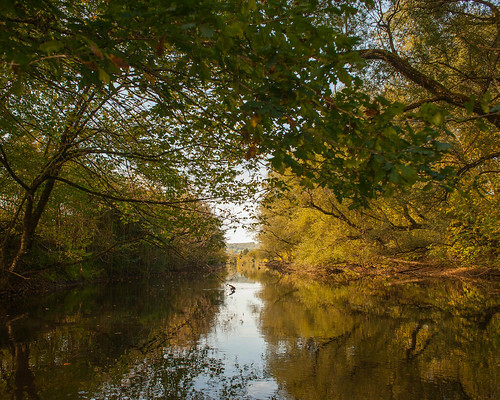 It all depends on the river levels and the time of year. I’ve been here in the early spring when the river is high and you can practically paddle through the woods! Just further on comes another choice a long slow meander on the right on a quick zigzag on the left. No choice. The left is more fun as you have to negotiate a series of slightly sharp turns in the quick water. After this little excitement the bridge at Allas-les-Mines comes into view and we can decide to take a small break if we want by pulling up on the grassy bank. This place has only two things: a working mine which extracts I don’t know what, and a very fancy restaurant, including a menu for 64 Euros! Still it’s a friendly place and if they are still open (it’s mid-afternoon by now) they will serve us a bottle of wine on the terrace. 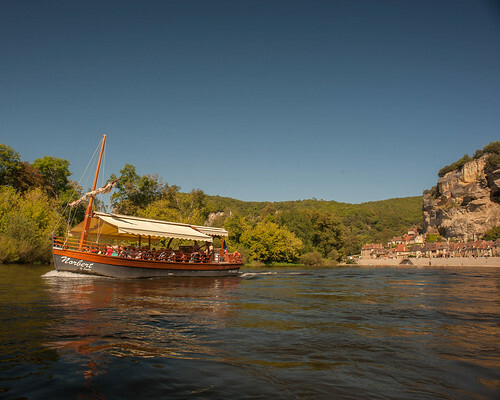 They have some very delicious and crisp white wines which are a great way to celebrate our final day on the river. 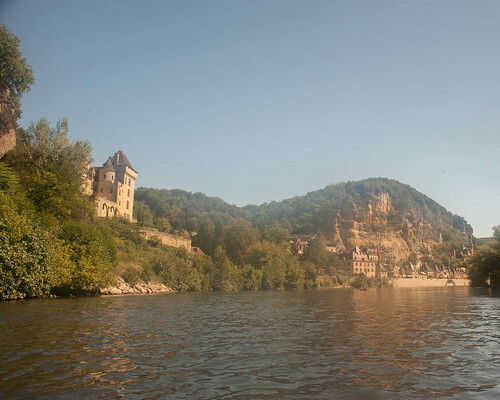 So after our short, or perhaps longer break, we are back on the river for the next stretch down to Le Garrit. Again we will hog the left bank looking for shade and channels although sometimes we will cross the river to tuck ourselves into the stream where the water flows faster. In the height of summer this part of the river blooms with a water weed which can almost cover the whole width of the river. 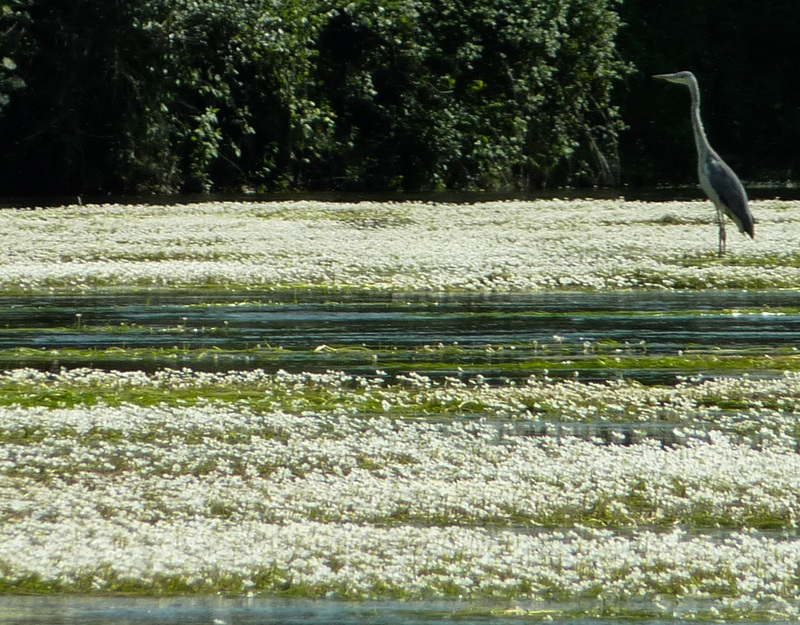 It has a white, with yellow centred, flower which covers the river like a carpet of snow. This is a natural weed that grows more heavily in some years than others and which gets swept away every season to re-grow the next. It’s known as Water-crowfoot. Soon the old broken railway bridge at Le Garrit comes into view and we have to be careful to come down the left bank as it is difficult to cross over if the river is full of weed. Just under the bridge we can pull over for another rest. It’s been a long day so we can decide that enough is enough and we can finish here. But it’s the last day so why don’t we take the canoes home and paddle a little while longer. If it’s hot we can cool off with a swim here and after a short rest we can be on our way again. 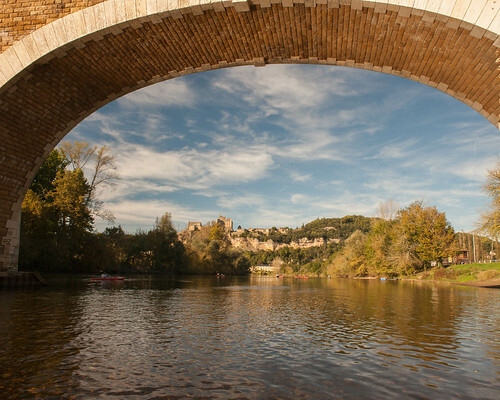 Paddling under the double bridge, one of which is the new railway bridge, the river soon sweeps around a long left-hand bend. We will choose the centre of the river now to take as much current as we can even if this means criss-crossing the river from time to time. That is unless we are looking for shade which is very hard to come by in this stretch of the river. If we keep a careful lookout we can dodge into a long narrow channel on the right bank and almost disappear from view as we appear to be in a canal. It can be shallow in here, and we may have to dodge some trees and eventually we will have to leave the cool and the shade to join the quick stream as it reaches into another bend as we approach the bridge at Siorac. Just under the bridge on the left side Eric has a shack from which he runs an office in the high season. We can pull over here for a quick chat and to see if he wants the canoes left here or whether we should continue for the last half-an-hour to his real base. Usually this is the case. So it’s back on the water for the final run with the last few channels to explore on the left before passing an often crowded swimming beach on the right and the wall which signifies the Canoe Raid base. The first time I came here I completely missed it and sailed on merrily downstream for another mile or so before realising. It was hard work paddling upstream to get back here so I’m extra careful these days to make sure I don’t go past. The take-out can be a bit tricky here as the water is fast and the steps down to the water steep. Eventually we haul the canoes out and dump our stuff in the van – it is here? 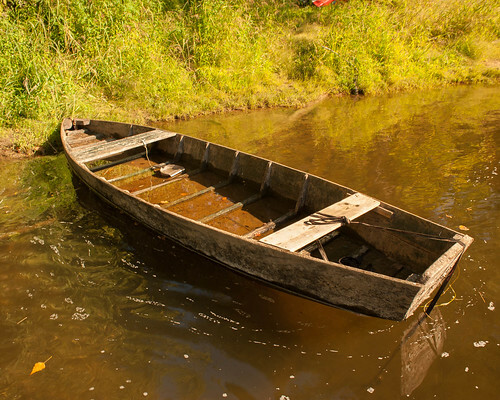 – before wandering over the road and returning the paddles and life-jackets to Eric. If we are lucky Eric is here himself. In the old days Canoe Raid was run by Eric’s father George, who sadly passed away a couple of years ago. George used to invite us up to his lair, as Eric does today, to sit down with him and have a beer and a chat after a long day on the river. His lovely face and smile is missed, but I am reminded of him every time I come back to the river. He was a lovely man. 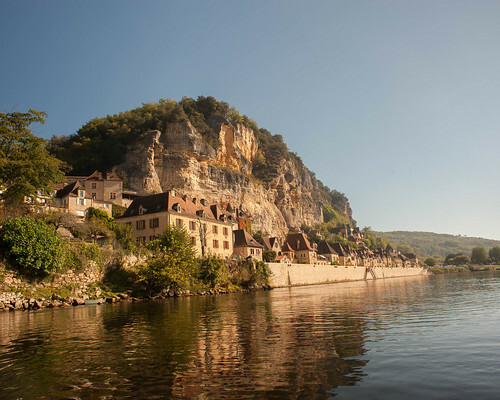 So finally we have finished our canoeing and we must get our tired bodies back in the van for the short drive to Beynac. We say goodbye to Eric, hoping that we will see him later in the season, or next season if it’s the end of the year. Back at the hotel everyone will scuttle off to their rooms. We might just wander out the back to the hidden away swimming pool for a last half-hour relaxing before dinner. Everyone reconvenes at about 7 30 for dinner. 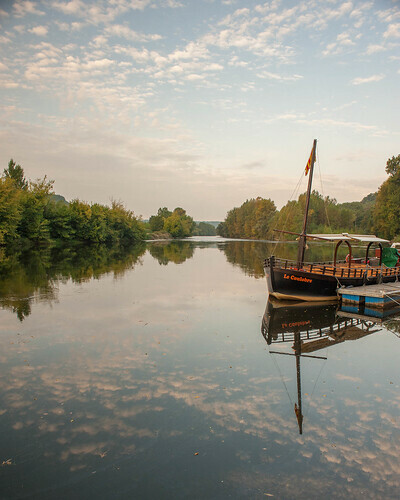 We can celebrate with a few glasses of wine and recall the highlights of our days on the river. I expect everyone is tired and looking forward to a rest at home. I will thank everyone for their company and we will share a few toasts. 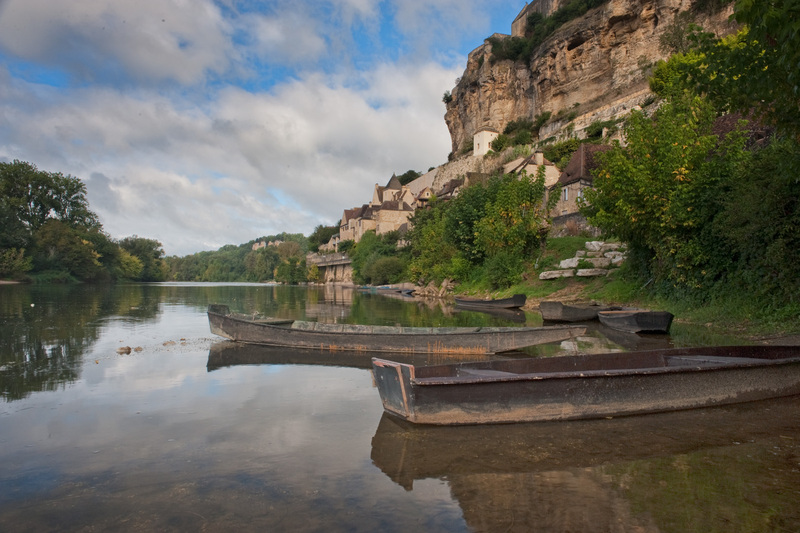 This entry was posted in Inn-to-Inn Guided Canoe Trips and tagged Beynac, Canoe, Castelnaud, Castle, Dordogne, Dordogne river, Holiday, Josephine Baker, Milandes, River, Siorac, Trip, Vacation on October 21, 2013 by Green River Canoes Ltd.